Sister Who Dish always seems to post a new recipe that just makes my mouth water! 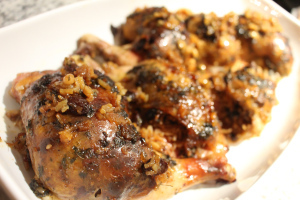 Here is a chicken recipe with Moroccan Sweet and Tangy Sauce with Rice and Dried Fruit Stuffing that I cannot wait to try. I just know it will make it to the top of my “gotta make it all the time” list! I have always loved the combination of rice and dried fruit with poultry so I just know I’m going to really love this recipe. Thanks for sharing the chicken love, Sisters Who Dish! This is my all time favorite chicken recipe that has it all. It’s like a whole meal tucked into a juicy chicken thigh. 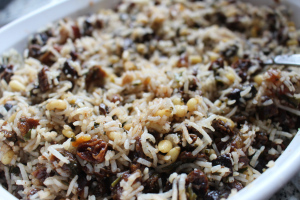 The filling is mixed with Cinnamon, dried fruits, and pine nuts. The chicken is brushed with a sweet and tangy sauce with herbs, honey, and lemon. The whole dish is baked in the oven, low and slow, until juicy, sweet, savory, tangy, and tender perfection. Now, stop drooling on your keyboard and check out the recipe below!!! We love this!!! Hope you enjoy this recipe, it really is the perfect go-to chicken recipe!! There is absolutely no doubt in my mind that I will definitely love this recipe! Wonderfully tasty recipe….thanks Dibbles and Dabs! Celebrating a passion for cooking by sharing recipes, current food trends, and more.